An expert guide to some of the lesser-known places on Ibiza that are truly awe-inspiring. Ibiza's universal appeal, the internet age and the camera phone means few things are secret nowadays. You find scores of information on the best restaurants, beaches and natural beauty spots at your fingertips - and everybody has their favourites. For each Dalt Vila, Es Vedra and Sunset Strip, there are a dozen of other lessser-known wonders Ibiza has to offer. Some of the following selection remained local secrets for years and as you will find out, with good reason. If you do venture out to discover these places, please do so responsibly. They are special and deserve to remain so, so avoid littering or damaging anything in your path: leave nothing but footprints. Here is our selection of some of the best awe-inspiring places to visit. Surrounded by pine-forest, this secluded lookout point just outside of Santa Inés is a real isolated gem. The literal translation of its name is "Heaven's Gate". Named accordingly, because the rocky outcrop in front of it, Ses Margalides has a natural gate-like arch and the sea seemingly extends into infinity. It's especially beautiful at sunset, though a great spot for a moment of solace at any time of day. Stretching all the way from San Antonio in the west to San Carlos in the east is the 15,000 hectare, protected park of Es Amunts. There's rugged coastline, mountainous peaks, fields and an abundance of indigenous wildlife. 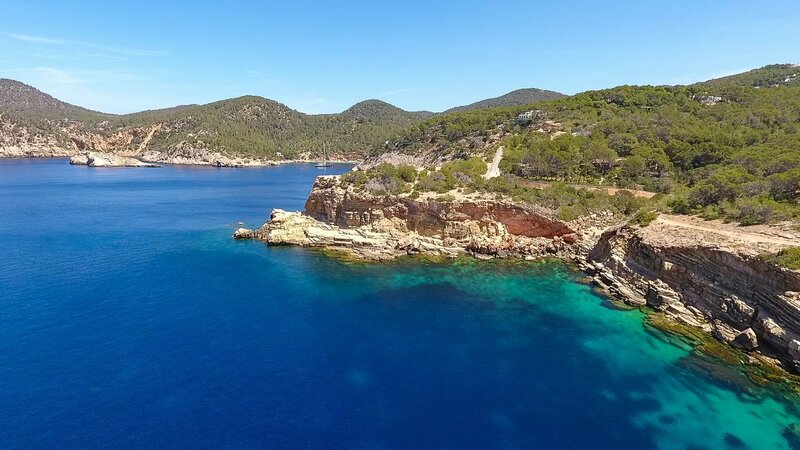 Easier to explore are the coastal areas of Cala Xarraca (pictured) San Miguel port and Cala Salada, though as it accounts for over 25% of the island, many more jewels lie within with routes to discover them. Just a little further south of Cala Salada on the west coast lies Punta Galera north of San Antonio on the road to Santa Inés. Known for rock formations that form strange natural shelves, these provide the perfect flat platform to lay down your towel and soak up the rays. They also double-up as a stairway down to the sea, making navigation slightly less hazardous. Totally unspoilt, you won't find any brash beach clubs or loud thudding music here. A rare noise-pollution-free zone. Bliss. The world is getting smaller - and that is equally true of Ibiza. San Juan, however, remains almost in a suspended timelock. The island's last remaining village is quaint and completely free of international enterprise. This is a brand-free zone. San Juan can even claim to have some of the most unique building design in all the Balearics. Sundays, which host the ever-popular market, is the best time to go. You can even sample some delicious homemade hierbas. Towering 136 metres above sea level and home to a variety of birds of prey, conquering Cap des Falco on the southern tip is a rewarding experience. Get some fresh air in your lungs and take the trek from Las Salinas. Be advised, this isn't a walk suitable for novices. With five challenging peaks on the route, you will need to be well equipped and suitably attired. The payoff is the stunning view out across the salt flats (pictured) once you reach the summit. Ibiza's beaches are known the world over. Sometimes, though, it's better to escape the crowds and find your own secluded spot of sand. Two of our favourites are Cala d'Albarca and Cala Llentrisca (pictured). The former is shielded by cliffs on each side, keeping it well hidden. Marvel at the natural bridge of stone. Meanwhile, the latter gives great views of Es Vedra from a different perspective, but is considerably less populated than Cala d'Hort. Peacefully idyllic. Stirring childhood wonderment, Atlantis needs to be seen to be believed. A former quarry, the hand-carved pits fill with sea water creating man-made basins. Adopted by the island's prominent hippie contingent in the '60s, murals and further etchings have been later carved into the rock. Be warned, it can get a little treacherous underfoot to get there and back, so suitable footwear is required. But you can strip off to your bathing costume once you reach this enchanted place.